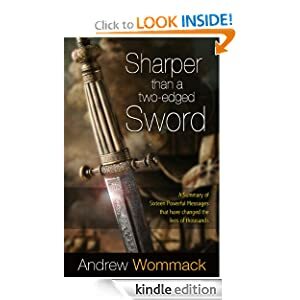 This weeks bible study is on chapter 2 of the book Sharper Then a Two-Edged Sword by Andrew Wommack, and we will be learning about the Holy Spirit. God's word is there for us, all we need to do is open his book. The Bible has all of the answers to our problems, if only we will open it and read. Do we have to be baptized in the Holy Spirit? All Scripture is given by inspiration of God, and is profitable for doctrine, for reproof , for correction, for instruction in righteousness. that the man of God may be complete thoroughly equipped for every good work. 1. 1. How is the Holy Spirit going to help me live the Christian life? The Holy Spirit is who helps us understand the Bible.. It is not enough to know in your mind what the Bible says, it is the Spirit that helps you discern the word of God. 2. 2. Why did Jesus tell His disciples not to do anything until they received the Holy Spirit? What does Jesus say in Act 1:8 to his disciples? How strong are we on our own, then and how much stronger with the Holy Spirit? With the Spirit we can do anything. He tells them they are to wait for the Spirit, because they are going to go forth and represent Jesus and his teachings to the world. They would fail as witnesses without the Holy Spirit. 3. 3. What is the difference between being born again and the baptism of the Holy Spirit? Acts 8:14 - 17 and Acts 19:1-7 both talk about the difference between baptism of water and the Holy Spirit. Now when the apostles which were at Jerusalem heard that Samaria's had received the word of God, they sent unto them Peter and John: Who, when they were come down, prayed for them, that they might receive the Holy Ghost: (For as yet he was fallen upon none of them: only they were baptized in the name of the Lord Jesus.) Then they laid their hands on them, and they received the Holy Ghost. In Acts 19:1-7 it says that when Paul asked some people if they had been filled with the Holy Spirit. They did not even know what the Holy Spirit was. He then prayed for them to receive the spirit and they started speaking in tongues. The apostles had been baptized by water already, and the Samarians had also been baptized in water. What does it take to become born again? Rom 10:9-10 All it takes to be born again is to confess that Jesus is Lord and believe in your heart that God raised him from the dead. 4. 4. Are you saying I didn’t get all of the Holy Spirit’s ability when I was born again? When we are filled with the Holy Spirit do we receive gifts? Yes, we receive gifts when we are filled with the Holy Spirit. What are these gifts? There are many gifts, not just tongues. The Holy Spirit is also our Comforter, kind of like a blanket for a child, He is there for comfort and security. 5. 5. What does “speaking in tongues” mean? • Do we still receive the gift of speaking in tongues today? • What would cause you not to speak in tongues? Why would God give me the gift of the Holy Spirit when I still sin? • If I were perfect, would I need the Holy Spirit? These are all questions that I would like you to think about. Please let me know what you think. I will be happy to answer any questions you have. Just let me know. 6. 6. Why should I speak in tongues? What is it going to do for me? · Speaking in tongues is using your voice. You have to speak to speak in tongues.